The smartphone market is slowing down. IDC reports that last year growth in worldwide shipments fell from 28pc to 10.4pc, and will remain on a downward path this year. The biggest dent in the market is at the high end. As Tested Technology predicted over a year ago, those bling phones are being overshadowed by the rise of commodity phones, utility items that deliver what users need—and no more—in a plain package at an affordable price. Manufacturers of high-end kit have a choice: join the race to the bottom, or devise a new category of bling phone that plays down the bling while offering palpable functional advantages. Real benefits, not just features. And that’s exactly where the Mate 9 seems to be aiming. In part 1 we touched on the general form factor of this (as I would call it) “right-sized” phone, the Android 7 operating system, and Huawei’s improvements to its Emotion user interface. Now is the time to look at the Mate 9 in detail. And I’ll try to focus—as I say—on the real benefits, not just the features. So, for example, there’s a 20M pixel camera. That’s a feature. But the way it gets used by the Mate 9 is fascinating, and I think adds real benefits (more on this below). The Mate 9 houses a large battery—specifically 4,000mAh. There’s a definite benefit here, but it’s harder to quantify. Huawei claims you’ll get two days use on one charge, or a day and half if you’re a heavy user. I suppose during this testing I must be a very heavy user, because typically I find I’m hitting the Mate9’s 20% low battery warning at about 7.00 in the evening. Admittedly, that 20% warning level is high. Many phones will wait until 10% before warning you. I couldn’t find any way of changing this on the Mate 9, but you can opt out of the offer the phone makes at this point to go into power saving mode. 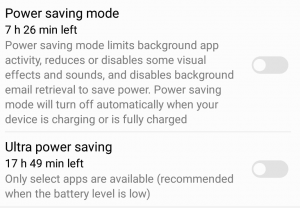 I tend to skip power saving mode (it shuts down functions that might be important, see screenshot) and either press on or put the phone on charge. At the launch, Huawei’s president, Ren Zhengfei, made much of the Mate 9’s built-in AI that’s supposed to track your usage of the phone and tune the battery use and general efficiency accordingly. I haven’t been using the Mate 9 long enough to see any palpable benefits from this. But I have done the standard “clear system cache” procedure to clean out the phone and get it running smoothly again. Swiping across the screen switches between Meeting, Interview and Normal recording modes. For press interviews I’ll sometimes use my phone as a sound recorder. Samsung phones excelled at this: two and a half years ago, the Galaxy Note 4 introduced a valuable audio recording feature called “Meeting Mode”. This used the phone’s three built-in microphones to identify the location of up to eight people sitting around a table. During playback, selective voices could be muted or emphasised, a distinct benefit for anyone preparing the minutes for a rowdy committee. 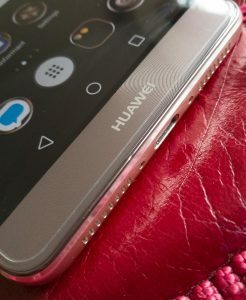 The Mate 9 has a total of four microphones, two at the bottom for regular phone speech, one at the top beside the earpiece for noise cancelling and one above the main camera. 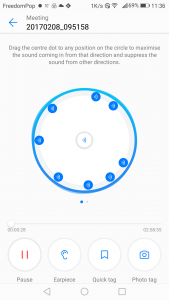 Huawei has borrowed Samsung’s Meeting Mode idea and improved on it by adding Interview Mode, using similar technology to distinguish between a pair of voices sitting face-to-face. While recording, whether in Normal, Interview or Meeting Mode, you can add bookmarks, called Quick Tags, to enable you to find particular passages later. You can also add tags afterwards, during playback. An additional feature I’m still trying to get to grips with is the ability to add photos to a tag. I can see this might be useful, for example, if you’re looking round an expo, taking voice notes and interviewing exhibitors. But I’ve yet to try this out, so I’m not sure to what extent its actually a benefit. In the P9 the two cameras are identical except for the inclusion of a Bayer filter on the colour camera. The Mate 9 takes the same idea one step further by enlarging the sensor matrix on the monochrome camera to 20Mpixels. The colour camera remains at 12Mpixels, as on the P9. The P9’s main dual camera is completely flush with the back of the phone—no “camera bump”—with the two lenses mounted side by side in the top left of the rear casing. I noticed during the launch presentation of the Mate 9 that the dual camera, now centered at the top rear of the phone with one lens above the other, protrudes very slightly above the back surface. The moment I saw this I found myself hoping that one of the short-comings of the P9’s phone had been remedied. The P9 has no optical image stabilisation (OIS), presumably because there’s no space for physical movement in the compact lens array. Did the slight camera bump on the Mate 9 now mean that Huawei had managed to squeeze in IOS? Happily, yes! The OIS isn’t the best I’ve seen in a phone camera, and doesn’t seem to help much with video, where it’s really needed. But it does cope well with single-shot handshake, thereby extending the low light capability. And that very minimal camera bump vanishes completely once the Mate 9 is installed in the translucent protective case that Huawei provides. One obvious advantage of expanding the luma camera to 20Mpixels is that monochrome photos, excellent on the P9, become full exhibition quality on the Mate 9. But most of the time you’ll be using the main camera for colour. Doesn’t the mere 12Mpixels of the chroma camera drag the quality down somewhat? In pure mathematical terms, yes. 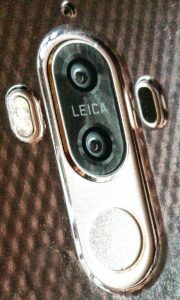 But Leica knows a thing or two about how the human eye works. It turns out that our eyes are much more sensitive to luma than they are to chroma. Luma, the lightness or darkness of any part of the image, defines everything that evolution has taught us is most important about what we see: shapes, edges and movement. The chroma signals we get from our environment are important too, of course. 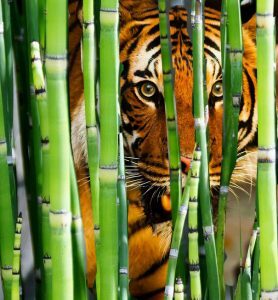 The bamboos are green, but the tiger hiding behind them is browny-yellow. He’s striped to fool us into thinking he’s just a patch of sunlight, but we’ve learnt that this particular colour signals danger. However, we don’t need to focus sharply on the colour to set our alarm bells ringing. We’ll certainly need to know if the tiger starts moving, how fast he’s moving and exactly in what direction. Luma information about the edges of the tiger will (let’s hope) give us all the data we need about that. Scientifically speaking, our luma acuity has evolved to be much higher than our chroma acuity. In plain English: human vision is very much more sensitive to light differences than to colour differences. Perhaps you see now where I’m going with this. A good picture needs well-defined edges and a full graduation of light and shadow. But for the picture to stay good (to the human eye) the colour can be slopped on rather less precisely. Lots of luma; less of the chroma. Technically this is called “chroma subsampling”. Our colour TVs have been using this cheat since the inception to reduce transmission bandwidth. And this is why the Mate 9’s dual camera can take an entirely satisfactory 20MPixel colour photo even though the chroma camera is only 12MPixels. 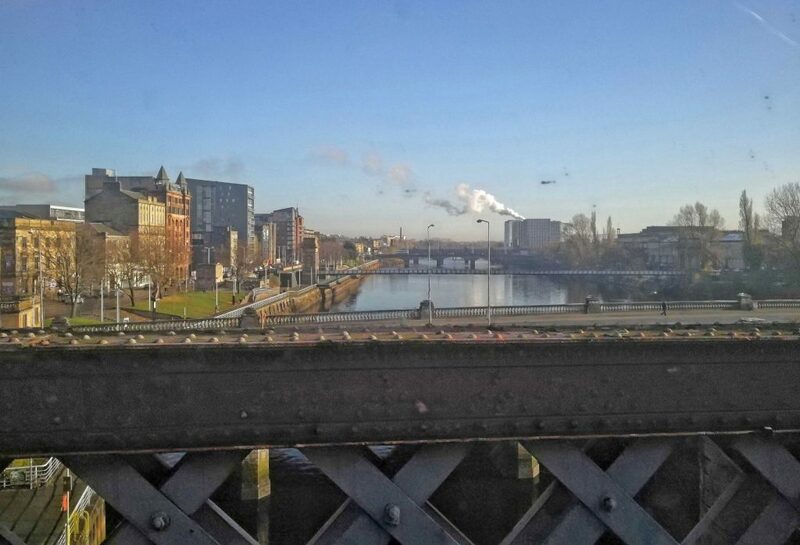 A rapid snap through a smudgy train window at 1/4000th with the phone LOCKED! If you take pictures using the more common 12Mpixel resolution the dual camera has another trick up its sleeve, also using chroma subsampling. The camera in your phone typically won’t have an optically zoomable lens (one reason phones haven’t replaced dedicated cameras yet, the other main reasons being that the large aperture of dedicated camera lenses and their correspondingly larger sensors capture a lot more information). Cameras in phones zoom by the simple expedient of enlarging the individual pixels, thus degrading the resolution. With the Mate 9 camera set to 12Mpixels, the 20Mpixel luma camera can zoom 2x with only negligible pixel enlarging. As the other camera, starting at 12Mpixels, zooms to 2x, the colour information supplied by each of its pixels will need to be stretched out into the surrounding luma pixels. More chroma subsampling. With the luma camera providing those clean edges and well-defined graduations of light and shade, your human eye won’t notice the colour being spread a little more thinly. 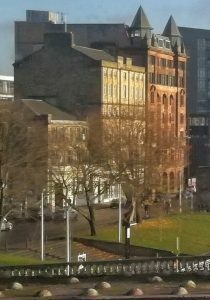 So, for most purposes, at 12Mpixel resolution the Mate 9 has a 2x zoom that’s indistinguishable from an optical zoom. There’s much more to be said about this camera. The ability to take a snap with the locked phone within less than a second simply by quickly double pressing the Volume Down button (see photo above) is a neat trick I’ve found myself using a lot. “Audio control”—the ability to trigger the shutter by saying “Cheese” might sound like a gimmicky feature. But in practice it turns out to be extraordinarily useful, for example when you’re holding the camera in your left hand to take a close-up of something in your right hand. The Pro feature with its ability to capture raw data, along with all the other clever stuff I mentioned in my earlier review of the P9 are all carried over to the Mate 9. Among them the much-vaunted, so-called “Wide Aperture” feature, although sadly there seems to be no noticeable improvement to the spurious blurry edges it can unintentionally produce. Big screen (alas not OLED, so not Daydream-ready), super-fast processor, vastly improved proprietary EMUI user interface, huge 4000mAh battery with fast-charging (although I do miss wireless charging), plenty of RAM and built-in storage with the ability to add a microSD card or a second SIM. Add to that an elegant, unselfconscious design with superb build quality (although waterproofing would have rounded it off nicely). On balance, the Huawei Mate 9 is the very best smartphone that has ever crossed my desk.